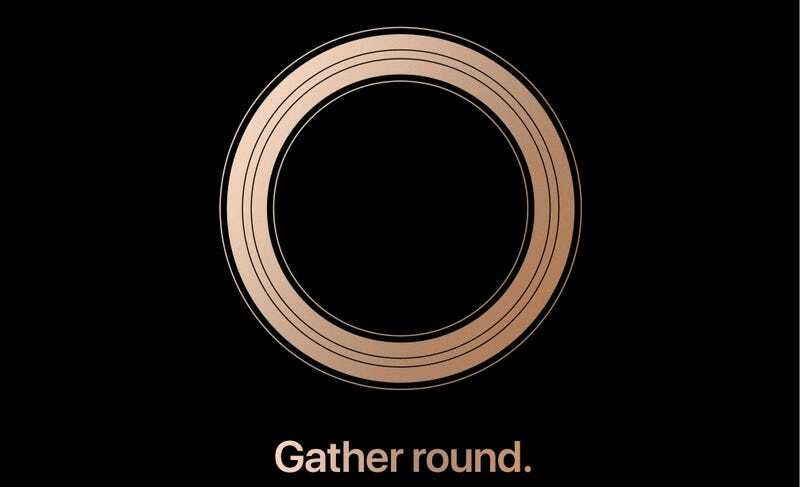 In a little less than a week a horde of rabid souls will cram into the Steve Jobs Theater on the Apple campus in Cupertino to watch Tim Cook and friends announce... something. As it’s September it’s safe to assume that something will include an iPhone. But what kind of iPhones and what other gadgets might Apple have in store? The event kicks off Wednesday, September 12 at 1pm EST/10am PST. You’ll be able to watch it live on Apple’s website, and naturally Gizmodo will be on hand, both in the theater and in our liveblog, to report on the proceedings. Here’s a primer on what we’re expecting to see. It is safe to assume Apple will be announcing three new iPhones. There will likely be a 5.8-inch device with an OLED display that resembles the current iPhone X. It will possibly be called the iPhone Xs. We will almost certainly make jokes about the price (expected it to retail for $800 to $900) and that name, even though it would actually be cheaper than the current $1,000 iPhone X.
That’s because the $1,000 price tag may well be reserved for its larger sibling, a device with a 6.5-inch OLED display. Expect many of the same features as the Xs, including a new A12 processor, 4GB of RAM, wireless charging, and Face ID camera array. This device would also likely have a larger battery. And it could really actually be called the iPhone Xs Plus, though BGR claims it will be called the iPhone Xs Max. Business Insider says it could start at a whopping $1,100. On the cheaper side of things, Apple is expected to launch a third phone, that will carry a notch and Face ID camera and hopefully an A12 processor. But this device will have a 6.1-inch LED display, no glass back, a single rear camera, and a variety of color options. Despite being larger than the Xs this phone is expected to have the lowest price tag of the three devices: $600 to $700. That’s quite affordable in this day and age! Unlike the other iPhones discussed, this one’s name wasn’t leaked. We can be reasonably sure Apple will stick to its habit of shipping the phones soon after the announcement. Expect phones to be available for pre-order the Friday after the announcement, September 14, and to ship later this month. If you’re in need of a new phone and are interested in these iPhones (or want an older iPhone for cheaper) than try and hold out until at least September 14. While a lot of us call Apple’s annual September event iPhone Day, Apple always announces other products. This year those products could include two new Apple Watches—the Apple Watch Series 4. 9to5Mac discovered a shot of these devices, allegedly leaked by Apple, the same day it discovered the image of the iPhone Xs. The image corroborates rumors that the device cases will increase in size—from 38mm to 40mm and from 42mm to 45mm. But those slight increases in case size will accompany a significant 15-percent increase in display size. Some of the the magic will happen by trimming the bezel on each watch to increase viewable area on the watch face. Apple launched an updated cheap iPad back in March, but that device’s improvements were almost all internal. On September 12 Apple is expected to announce a refreshed iPad Pro that loses the Touch ID and bezels. You guessed it: That means Face ID is probably coming to the iPad. The new iPad is not expected to have an expensive OLED display or a notch, but it should include a new processor, GPU, and a Smart Connector (which allows it to connect to keyboards) on the back of the device instead of on the side. Bloomberg’s Mark Gurman also claims it will have support for Face ID in horizontal mode. With a new iPhone comes a new operating system. You can expect to finally say goodbye to the beta and hello to the full release of iOS 12, which will land around the same time as the new phones. With the Apple Watch getting a refresh, you should anticipate the announcement of a release date for watchOS 5. macOS Mojave, which brings a new dark mode, improved Finder functions, and an updated App Store is expected this fall as well. Hopefully Apple will take the time to announce its release at the event too. Last year, Apple promised us a pad that wirelessly charges three Apple devices at once, and we’re still waiting. While inductive charging is common, apparently Apple had trouble creating a device that could charge three products at once. But now rumors say those troubles have been resolved, and it could very well arrive at the September 12 event, where many devices with wireless charging will be launched as well. Since the runaway success of the first generation of AirPods, rumors have suggested that improved AirPods with better audio fidelity were on the way. Now those rumors suggest these AirPods will launch not on September 12, but some time next year. There have been persistent rumors that Apple will launch either an affordable laptop to replace the all but dead MacBook Air by the end of the year. These are exciting rumors, but it is deeply unlikely they’ll come to fruition September 12. Intel, which makes the CPUs Apple uses in all its laptops, just announced a refresh of the processors series used in the MacBook, so there’s a chance Apple will announce a refresh this year—just not the same day it launches its new phones. Yes, Apple is reportedly working on a smaller, cheaper HomePod, and Apple-branded over-the-ear headphones, but those products aren’t expected to be released this year. Same goes for the new Mac Pro and that rumored ARM-based MacBook. It’s highly unlikely Apple will announce or even tease these products this far out. It did that with AirPower and we’ve all been glaring and tapping our Apple Watches ever since. (The Apple Watch, by the way, was also announced the year before it was released.) But Apple is also the company that popularized the phrase “one more thing...” so there could, maybe, be a few cool surprises in store.